The "Decline" is a 60-ton construction shows a house of cards made of nine concrete play cards and has a scale of thirty five feet high and nineteen and a half feet wide. The construction is literally as big as a house. The traditional images on the cards are replaced by a selection of historical figures, world leaders and dictators. 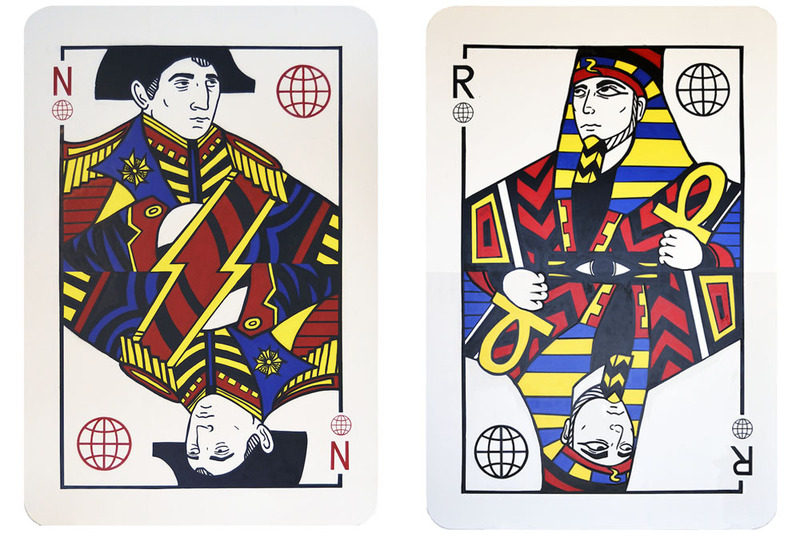 The selected images and the shape of the cards are being presented as a metaphor for the fragile construction of different political, philosophical and religious views on mankind and worldviews. The used materials and the "concrete walls" then refer to the historical and current political use of walls to 'shield the indigenous population’ and to protect them for ‘foreign influences'. With these forms, the selected images and the material used, the artwork remind us of the great human suffering that arises from dogma and dictatorship and highlights the need for global cooperation and reconciliation. Finally, the title of the work ("decay") arises doubt about whether the house of cards is actually still building up, or if it all of a sudden will collapse into each other. In this matter the artist raises the fundamental question about the possibility of progress and the malleability of society. When the work was placed, the artist got a mad phone call from the mayor of the city. She was affronted by the Hitler card that was presented on the installation. The mayor asked her staff to cover the Hitler card with plastic because "the city of Sint-Truiden suffered a lot in the Second World War". When the media heard about this censorship it became national news. The people of the city revolted and took away the plastic at night. The pressure of the public opinion rose heavily and Herck did not want to compromise with the demands of the mayor. In the end, they’ve kept the installation in his true form, respecting the freedom of speech of the artist. One year later when the work got more recognition, they even put permanent lighting on it so people could also enjoy the work at night. © Text by Tom Simons.